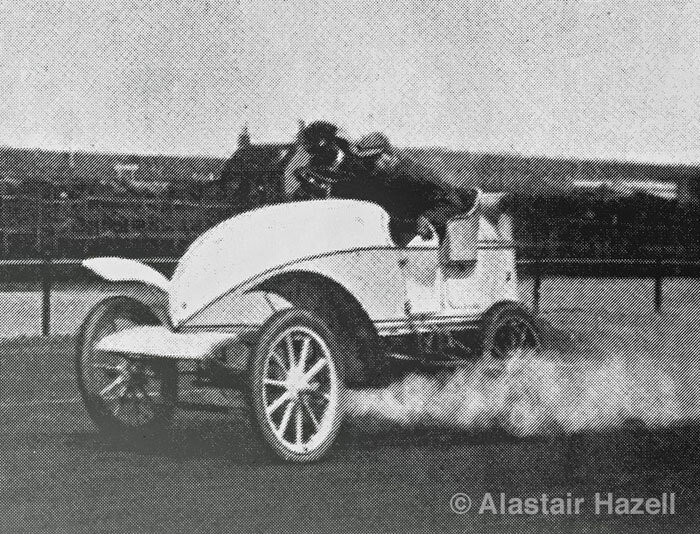 Today the trail-blazing motor racing drivers of 1902 seem as remote in the minds of those connected with the present day sport as the Casablanca Grand Prix. 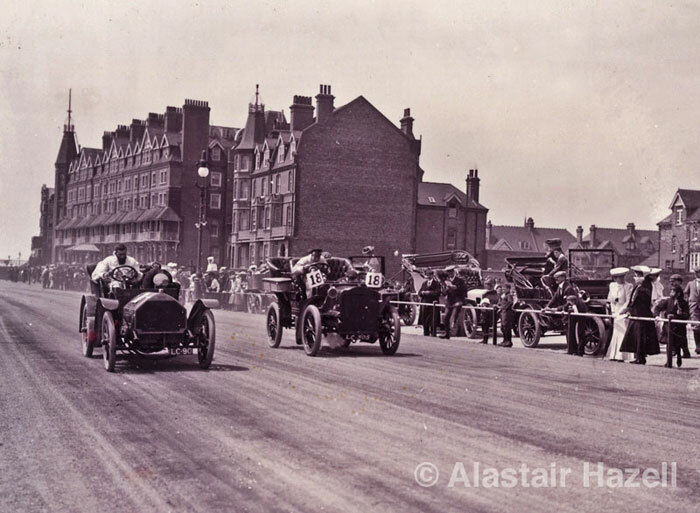 Bexhill's motor races did not occur in isolation but were part of a campaign to promote Bexhill-on-Sea as a fashionable new resort and used the Bicycle Boulevard, which the 8th Earl had built along De La Warr Parade in 1896. 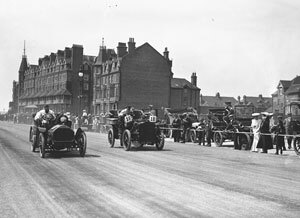 In the May of 1902, the 8th Earl De La Warr worked, in conjunction with the Automobile Club of Great Britain and Ireland, subsequently the Royal Automobile Club, to organise the very first automobile racing on British soil. Such was the occasion that thousands flocked to Bexhill to witness the unique spectacle. The very atmosphere reeked with the smell of paraffin with throbbing, puffing and snorting motors everywhere. Away up Galley Hill at the far end of the course one could see a puff of smoke and a fair-sized speck emerge from it. A few seconds later a monster dashes past, causing the very earth to tremble. Nothing could be seen of the drivers except a crouching figure with streaming hair, whose hands had a death-like grip of the steering wheel. Not only were straight sprint races run from east to west against the clock but cars raced side by side in the opposite direction, very much resembling the start of the Grand Prix races today. Distinguished names appeared on the entry list. There was Lord Northcliffe, the founder of the Daily Mail Newspaper in his Mercedes. 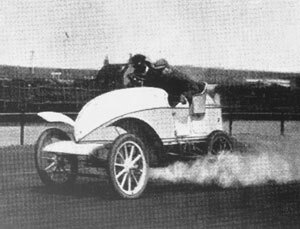 Monsieur Leon Serpollet, the Frenchman, in his steam driven "Easter Egg" with the fastest speed of 54mph and the first French victory on British soil. The indefatigable Mr S F Edge, who ran his Napier against a large entry of French owned Darracqs, and many more well known personalities of the day. Mr Serpollet appeared at the event having broken the World land speed record, at 75.06 miles per hour (120.80 km/h - speed conversion), in his "Easter Egg" the month before. More than 200 entries competed in that inaugural meeting in 1902 and the local hotels and boarding houses were packed with the curious who had come to witness, for the first time on British soil, the spectacle of motor cars racing at speeds in excess of 50mph when the speed limit of the day was a mere 12mph. The huge success of the meeting encourages Earl De La Warr to make Bexhill the motoring centre for British racing drivers of the day. By 1906 plans were drawn up for a circuit almost reaching Beachy Head, with garages, restaurants and hotel accommodation. The course unfortunately never saw the light of day and the motoring set moved to the new Brooklands circuit in 1907. A few attempts were made to resurrect the races and the last competition was held in 1925 after which the Royal Automobile Club withdrew permits on public highways. Original article on Discover Bexhill.